Years ago in a class on family relationships someone asked the students what they liked about their childhood family. There were many varied responses but we all paused for a moment when one respondent offered a unique response – “forgiveness.” Most families have their share of fights, mistakes, grievances and yes, even those big mistakes we term “sin.” Some of these mistakes are costly and have led to years of grief for some of the people involved. But as I have participated in and watched successful families over the years it seems that happy families have a way of seeing mistakes as bumps in the road rather than the end of the road. Tempers may rage. Mistakes may cause irreparable damage. Tears may be shed. But successful families and individuals do not rehash old problems for years to come. They link arms, regroup forces, and move on. In today’s world, more than ever, families need the power of forgiveness. With so many forces arrayed against our families, if we are to keep our families together we need to develop the capacity to forgive. Like a healing balm a forgiving heart repairs, soothes and heals the wounds that are inflicted, often by too much contact with a rough, unfeeling, and tempting world. 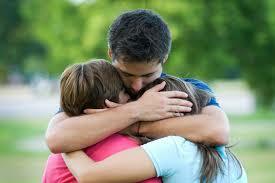 Studies show that forgiving families are happier. Forgiveness in families has been correlated with a more positive experience in the family environment, with improved relationship healing, with greater marital satisfaction and even with more romance in marriage . Of course, on a personal level forgiveness has also been correlated with better mental health, physical health, and healing from trauma. Bitterness and blame on the other hand have been correlated with higher levels of illness, decreased ability to adjust to external events in one’s life, and higher levels of anxiety and depression. Even in instances of severe trauma like divorce, forgiveness can be a healing balm. Scholar M.F. Trainer studied divorced persons and concluded that those who were able to truly forgive their spouses experienced greater adjustment and personal power. Self-forgiveness has also been considered a crucial component in healing from divorce. “If we really want to love, we must learn how to forgive” said Mother Theresa. Learning to forgive is a process that may take time. There are two elements of forgiveness that might be helpful to consider as we seek to become more forgiving. Sometimes the other party does not desire reconciliation. A relative of mine was abandoned early in her marriage. Left with three little children to raise she probably had moments of self-pity and even self-doubt. However, a wise boss told her that she needed to “pull herself up by her bootstraps” and move forward. She did this. Although the next years were difficult she left bitterness behind her. Never once did she complain or engage in unkind conversation about her ex-husband or the woman to whom he was now married. She lived a peaceful life and worked hard to give her children the very best life and opportunities that she could. She eventually married again and built a solid and good marriage with a man who was always true to her. Now in the twilight years of her life she is lovingly cared for by her three children and her peaceful ways and kind personality are an anchor to them and to her many grandchildren. If reconciliation is not possible, then move forward in your own life in a positive direction. It was Jesus himself who counseled: “Love your enemies, bless them that curse you, do good to them that hate you, and pray for them which despitefully use you, and persecute you.” (St. Matthew 5:44, KJV). Ivan Boszormeny-Nagy was an early pioneer in family therapy. He noticed that often destructive patterns in families were passed on from generation to generation. He suggested that to remedy this cycle adult children must “develop empathy for their parents through trying to understand their parents’ upbringing and circumstances in their families of origin.” (As cited in James M. Harper and Mark H. Butler, “Repentance, Forgiveness, and Progression in Marriages and Families”). This empathy would allow them the freedom to break family cycles of bitterness and revenge. One part of this empathy is learning to block from our minds unkind or vengeful thoughts or feelings about the person who has harmed us. Mindful focus on positive thoughts – even on a favorite song or poem – can divert us from the negative and harmful thoughts about a loved one that sap us of energy and strength to restore relationships or to move on. Not focusing on “evening out the score” or on a list of debits and credits allows us to begin the process of feeling empathy, understanding and even love for someone who has harmed us. Virginia Pearce in her book Extending Forgiveness postulates that “if we let things build up and are unforgiving in our families and homes, our families will petrify and harden.” Forgiveness mends the damage that will come as part of living in a troubled world. It breathes new life into families – allowing them to flourish and to grow. Indeed, the student whose answer gave us pause for consideration had the answer – forgiveness is crucial to the continuation and regeneration of our families today. I appreciated the article by Elise Ellsworth on “Forgiveness” in our families. How true that it is necessary for health and happiness in our closest relationships. I am thankful to have the ability to think creatively and determine my own motives, thoughts and acts in regard to myself and others.